Come and join Dolly Dimples for a spot of afternoon tea! Now you can send all your friends a special greeting using these delicious designs from Dolly Dimples Crafts. With this software you have complete creative control over these much loved images. 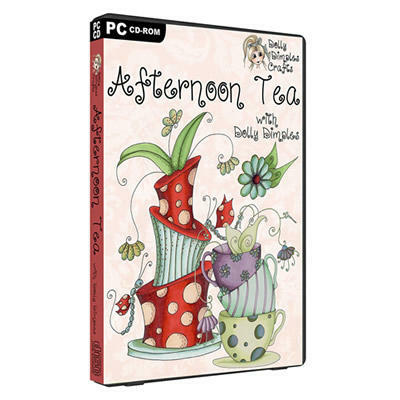 This software includes 20 cakes and 10 cups as scenes and on their own so you can decorate them to your own tastes. Position, size, re-colour, and then create completely customised cards, toppers, backing papers, envelopes, and more! This software includes over 150 individual elements (and 1000 ready to print sheets) that can be printed in a variety of sizes and combinations, they can be re-coloured or even printed as digi-stamps for you to colour - the possibilities are endless. Plus, once you have edited your image you can save it as a jpg or png allowing you to use it in other graphic software. Also available are resizable alphabets, gift tags, and card templates to name just a few of the exciting features. We’ve given you the ability to import your own images to add that personalised finishing touch to your designs. There are 30 pre-designed compositions available and ready to print as cards, toppers, backing sheets, gift bags, and more! We have some fantastic unique features including our original Teacup Box Sets plus a range of Alphabet Cards complete with decoupage sheets.